Well everybody, it’s been a long time coming but the field season is finally here (and after too much delay, the first blog post of the season as well!). I’m finally in the field…digging. There is a verifiable amount of dirt on my trowel so it’s official! It has (quite literally) been a long road to get here, and that road started in Prague with a visit to my friends Justin, whom you may remember as my co-supervisor last year, and his lovely girlfriend Veronika, who is something of an archaeological Czech superwoman. Yup, Justin is a lucky guy. Unfortunately, I had less than 72 hours of visiting Prague in the Czech Republic. It’s a colorful place with cheap beer, plenty of medieval history, and several photoworthy vistas along the Vltava River. A view of Prague Castle from across the river. 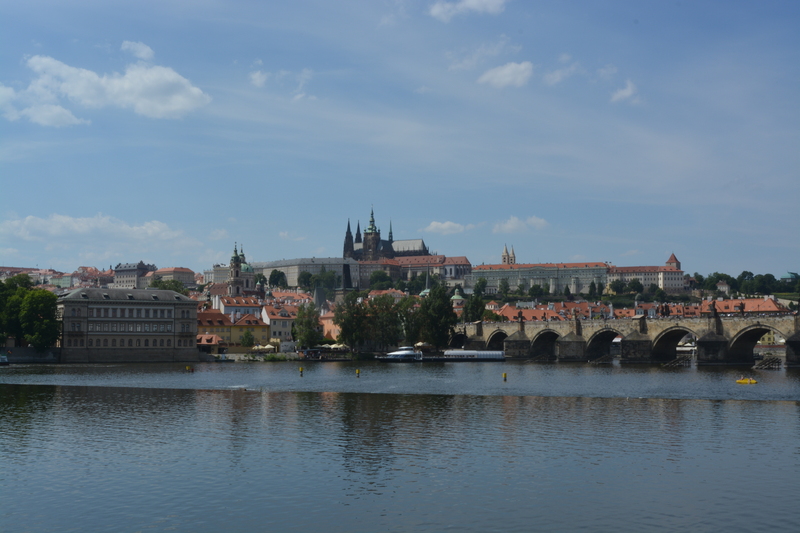 While I was only there for a short couple of days, I learned quite a bit about Prague and the Czech Republic. For starters, the Czech Republic was formerly Czechoslovakia, unified with Slovakia until the two split following the breakup of the Soviet Union. Concurrently, Czechs strongly resent being considered Eastern European for it’s Soviet connotation and prefer to be called “Central European.” Despite being part of the European Union, the country uses it’s own currency, the Czech Crown, which disappointingly is not a pile of actual crowns traded for goods and services. The country is also a sponsor of unique art and architecture. It also has several great examples of high medieval architecture and culture thanks to the nation’s most famous ruler, Charles IV. He has several monuments and structures dedicated to him, most notably the Charles Bridge and the Prague Castle (just up the hill at the end of the bridge). Charles was Holy Roman Emperor during the 14th century and for a while made Prague his capital. Prague was great and I’m bummed I had to leave the land of juicy meat and filling potatoes so soon. Nevertheless, the archaeological part of this adventure is taking place in Italy and Cyprus, so on Friday at midnight, we set out on an epic road trip to Pollena Trocchia. Many thanks to Veronika during this trip for two reasons: 1. She had the brilliant idea of leaving when we did so that we could witness sunrise over the Alps in Germany, Austria, and Italy; and 2. Because her car is standard transmission, she had to do all 15 or so hours of driving (told you she’s Czech superwoman). The vistas were amazing and during a pitstop in Germany, I had the privilege to finally use my knowledge of the German language in a German speaking country! 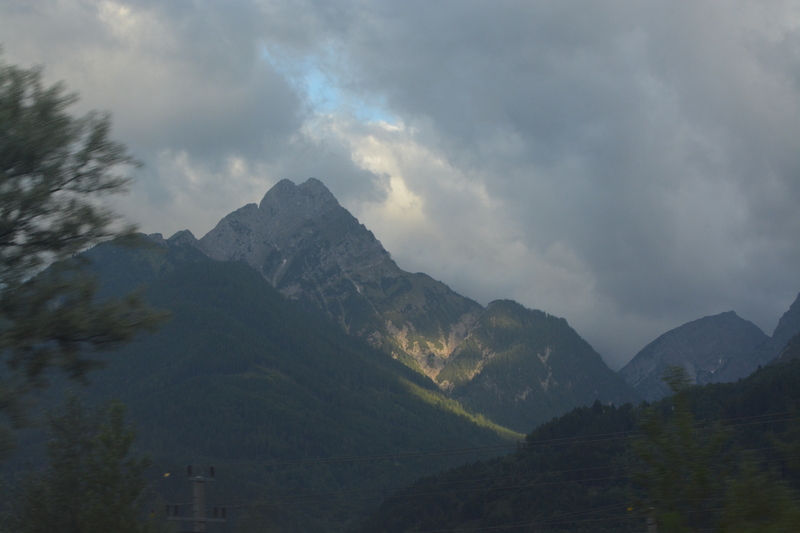 From nearly the beginning of the drive, we were spoiled with amazing views like these. 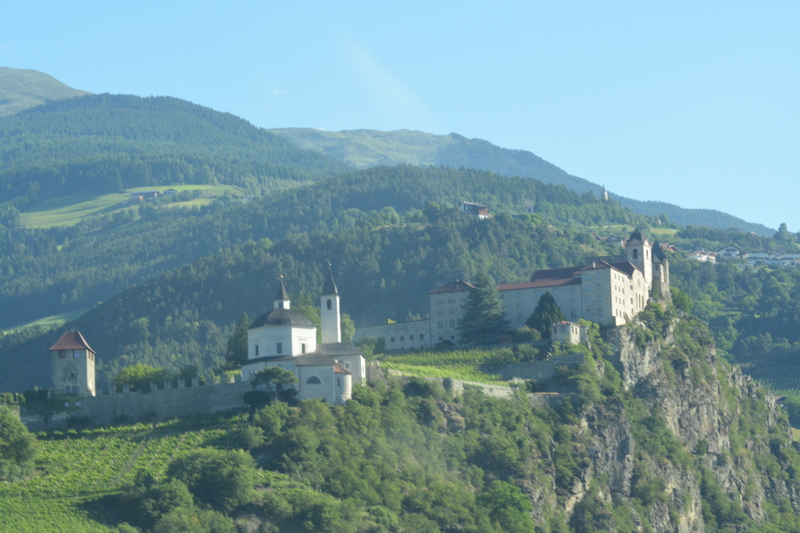 Many castles were roosting amongst the mountains. The drive was long and hot but we finally made it to Italy and had our first meeting with Ferdinando. Once the pleasantries were out of the way (there weren’t any awkward hug-handshakes, and instead I just gifted him a bottle of Bulleit Bourbon), we were briefed on the commencement of field activity. As is always the case with Italian archaeological projects, there was a modicum of anxiety in securing permits from the Sopraintendenza (the agency responsible for supervising archaeological projects among other things). This year, unlike last, we received the permits to start digging on schedule. Those permits, however, were acquired with a little stress on the part of Ferdinando and his new co-director Ben Russell (a professor in Classics at the University of Edinburgh, whom I also gifted with a bottle of Bulleit Bourbon upon our meeting). While there was no question about their qualifications nor the legitimacy of the organization, and, while enthusiastic about our results, wanted to conduct itself in a manner that separated it from previous misdealings within the agency. Ultimately, we are being required to do everything “by the book,” meeting every regulation that is relevant to the commencement of a new project. The regulations aren’t a problem and they’re welcome for ensuring that safety and proper archaeological procedure is followed; however, they will limit me from being able to disseminate pictures of our findings and features in the trench. Therefore, you’ll just have to rely on my narrative and use your imagination in lieu of visual aids. Our first day on site was focused on an orientation to the layout of Aeclanum and introducing our students to the lovely town of Mirabella Eclano. A lot has been accomplished by members of the Apolline Project since I left the site last August. Several new trenches were opened and a geophysical survey has been conducted of the area, providing clues to the location of several important components of a typical Roman urban center like the Forum and a road network. I have been assigned 3 great students in a trench that was opened towards the end of last season. Last season’s excavators found a collapsed wall of a building. The collapse was so well preserved that the window was still visible in the arrangement of the toppled bricks and tiles! As is customary for end of season procedures, last year’s team covered their trench with strips of thick cloth and backfilled over the cloth to preserve what they found. Our first task as a team was to remove this backfill and peel back the cloth. Unfortunately, this process proved particulary labor intensive and time consuming; nevertheless, it was necessary. Two days later and with the help of the other supervisors while students were working in pottery lab, we peeled the mess back! The next task was to secure safe access in and out of the trench without having to rely on a ladder. An area for extension was chosen on the West corner of the trench. We’d excavate stratigraphically, but reduce the width of each context to form steps which we would use to walk down into the trench more easily. Once the ramp was nearly complete, we split our efforts to investigate the preserved window in the collapsed wall. Ben suggested we begin excavating there in order to get a better idea of the stratigraphy underneath the collapse. We’d be literally looking through the window. What we found was a lot of highly fragmented bits of bone and ceramics. Interestingly, the bottom surface of the window was lined by ceramic tiles similar to those used in the roof, using the lip that normally interlocks with other tiles as a ledge, forming a window sill. One can imagine that flat surface serving the purpose of being a space to put a plant or toss stuff at the end of a day. Beyond that, we didn’t find anything particularly telling beyond being able to confidently approximate the depth/thickness of the collapse layer. By the time we finished our investigation of the window, our first week had ended. Regrettably, a lot of our time was spent prepping and orienting the team to our trench and the stratigraphy as it was established with last year’s work. I owe a big thanks to my field students Josh, Alex, and Harry for their patience and cooperation for making the first week productive! Access in and out of Mirabella is more limited this year, so adventures out and about in Italy will be difficult. Thankfully, we have Filiberto’s and our good friend Michelangelo as refuge! After the window, we shifted to the space in the east corner of the trench sectioned off by what still stands of the collapsed wall, picking up where last year’s excavators left off. The hope was to learn more about the direction of the collapse, i.e. did the wall fall inwards or outwards. Interestingly, the soil is similar to the soil in the layer above the collapsed wall, but it’s components were a mix of building material jumbled together instead of the neatly fallen roof and wall in the rest of the trench. The area where we were digging extended so deeply that we had to come out and dig benches into the limits of the trench to shorten our depth in accordance with safety regulations. Making these adjustments cost us a day, but naturally made us safer in the trench. On Friday, after having removed a huge haul of material, we found a new context, devoid of the big bits of building material and more compact than the previous one. We had dug below the foundation stones of the wall and have yet to find anything indicative of a floor on this side of the wall. 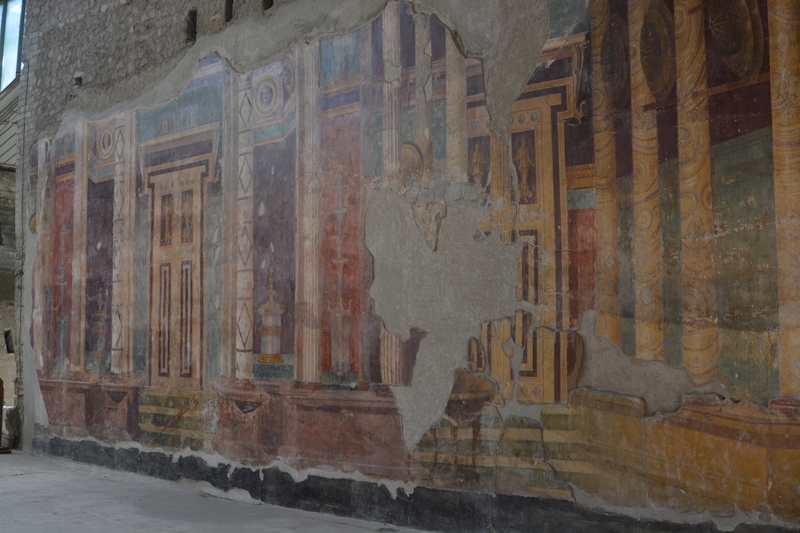 Within the next week, we’ll have permission from the Sopraintendenza to remove portions of the collapse itself and further explore the building that has captured our attention. As for the weekend, some friends and I spent a quick turnover in our old abode of Cappabianca after a day trekking through Herculaneum and the Villa Poppeia at Oplontis (including an awesome nap sitting one of the benches there). 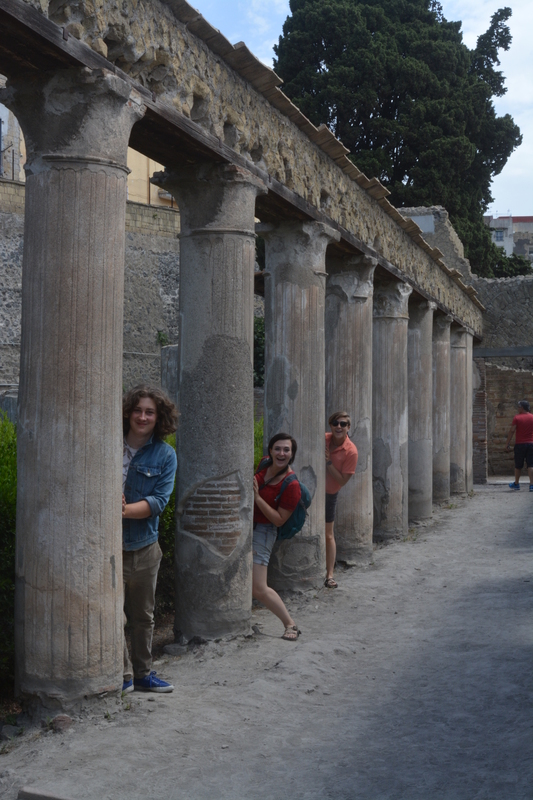 Callum, Alex, and Caity having fun in the ruins. 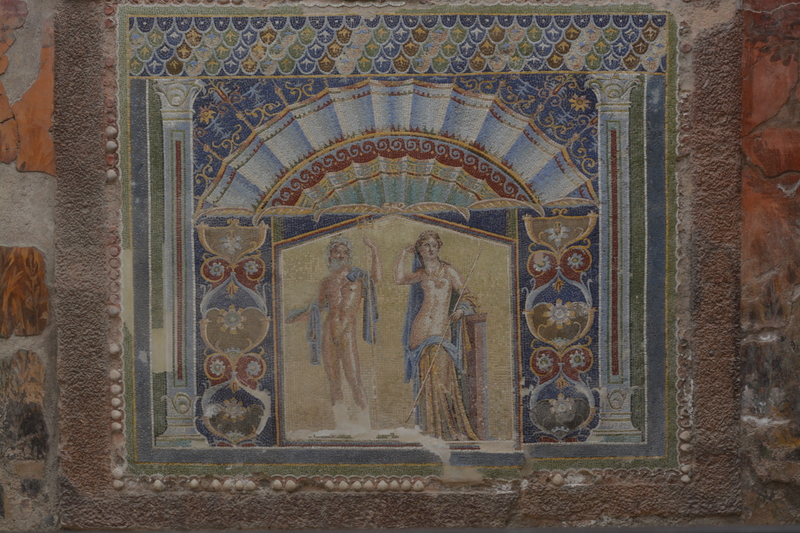 The House of Neptune and Amphitrite is named after this colorful mosaic preserved there. 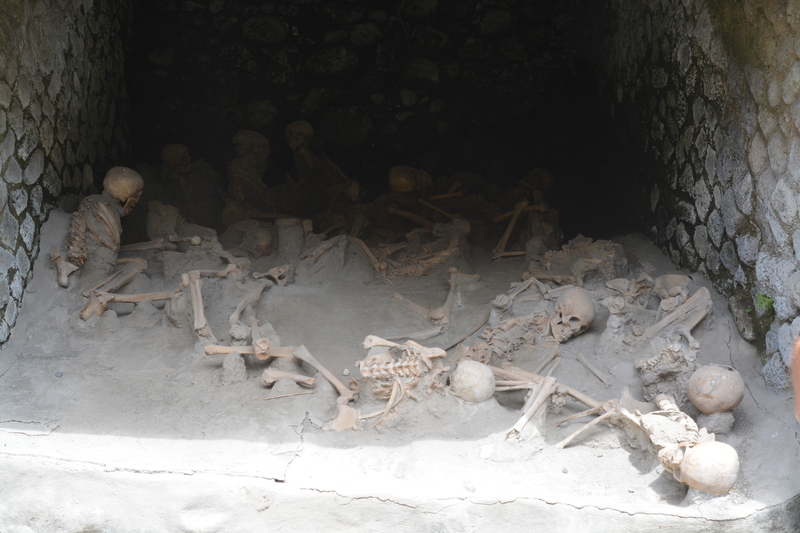 The people of Herculaneum took shelter in the docks from the eruption of Vesuvius in 79AD, but were vaporized by the volcanoes pyroclastic flow. 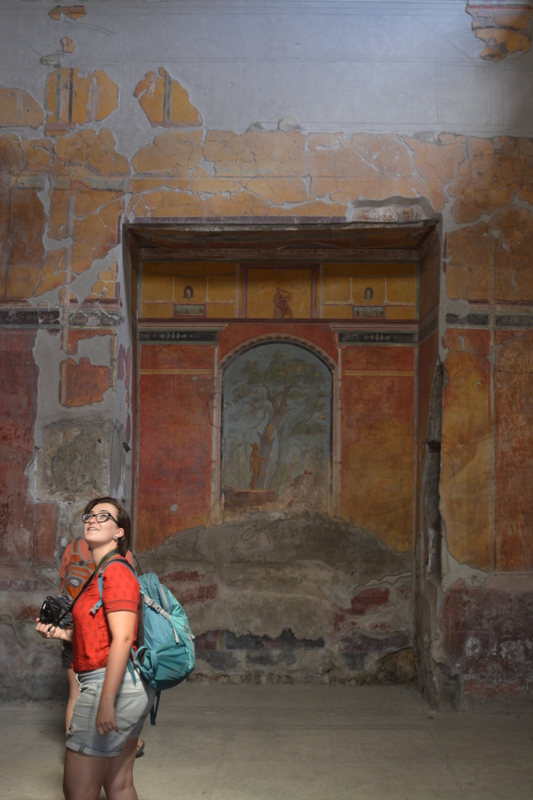 The Villa Poppeia’s frescoes are some of the best I’ve seen in all my archaeological travels. 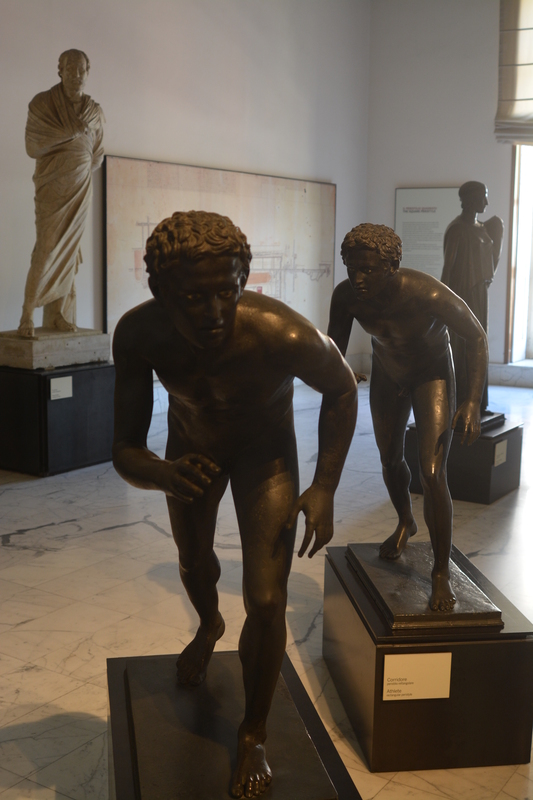 We had a delicious dinner in Naples courtesy of a recommendation from a friend at NeapolisparITA (those folks I mentioned as providers of higher quality local tour guides) and spent Sunday morning and afternoon strolling through the Naples Archaeological Museum. 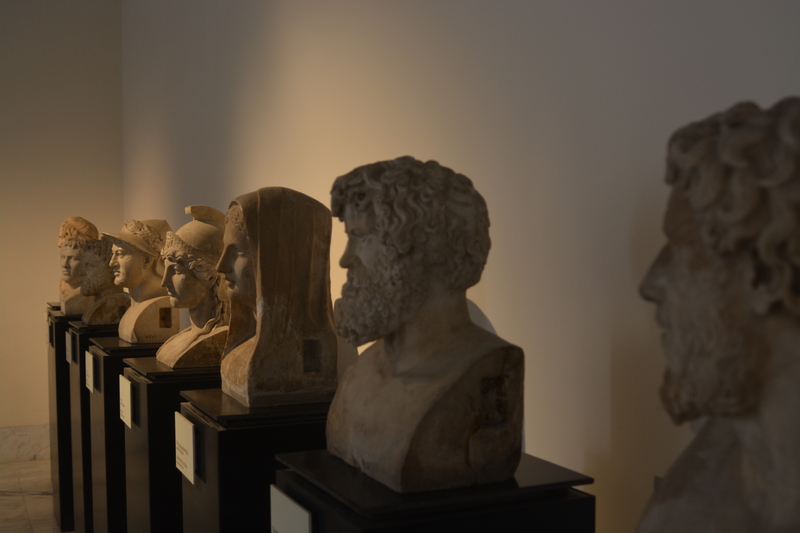 Being that it was the first Sunday of the month, we were privileged with free admission and an opportunity to go through rooms that are usually closed like the numismatic collection and the showcase of epigraphic materials. Amongst the new sights at the museum, I finally got to see artifacts from the Villa de Papyri. We’ve since lost Josh as he went back for graduation from college and gained a wave of new participants to the project. In their honor, I’ll be doing a review of some of the archaeological skills like stratigraphy and identification of materials to help them get settled to the trench!